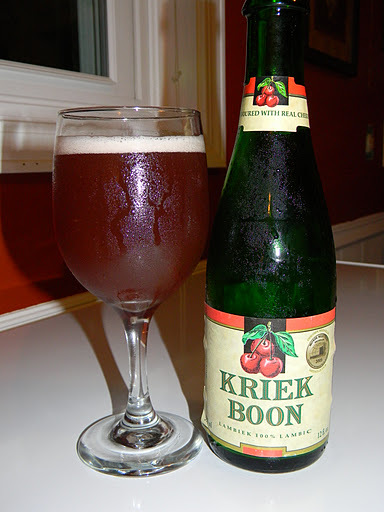 Review of Boon Kriek Lambic | Beer Apprentice - Craft Beer News, Reviews, Interviews and Info. For today’s craft beer review I’m going to be trying the Boon Kriek Lambic made by Brouwerij Boon located in Lembeek, Belgium. I don’t think that I have ever reviewed a Lambic on this blog yet, so I’m looking forward to sharing this experience with you. The website, boon.be, gave us this small description of this particular brew. How about we give it a pour? The beer poured a semi-clear, cherry red color with an off white head that had a slight pink tint to it. The head was small and tight with a retention time that was only average. The lacing looked ok as it left scant patches on the sides of the glass as the beer worked it’s way down. The aroma revealed a nice waft of cherries that beget some significant tart odors. A minute vinegar bouquet was noticed as well as a little bit of the funk and “barnyard” fragrance that typically accompanies this style of beer. It was very sweet smelling and pleasant to the nose I thought. Well balanced and even. The taste began with an easy going flavor of cherries. Sweet sugars and a very, very light acidity tickled the taste buds. The flavor does not explode with Sourness, but rather it eases into the tartness. This brew isn’t nearly as sour as some of the other Lambics I have had in the past, but some is present. A very light breadiness underlines the entire profile to give it a touch more complexity. I didn’t find any of the “oak” savors that were mentioned in the description though. Overall, the taste wasn’t bad, however it was just a bit underscored and not very potent. The moutfeel was medium to light. Very soft, slightly watery and smooth. The carbonation was decent and a little bit of flavor was left behind after the sip, but not much really. Personally, I think this would be a great gateway Lambic for someone interested in the style. It was nothing over the top or outrageous. Just an easy going fruit beer that would bold well for a craft beer drinker looking to expand their palate. It’s super easy to drink with some noticeable, however light, Lambic characteristics. The Boon Kriek is not anything I would be on the lookout for if I was a Lambic specialist, but if it was offered to me, I would have no trouble enjoying a couple of these during a sitting. Have any of you guys tried the Boon Kriek Lambic? What did you think of it? Be sure to let me know in the comments.